Transferred from the University Library in the late 1940s with the Memorial Library of Publications of the University of Pennsylvania and Her Sons. A few scrapbooks were found in the University Archives collections with uncertain provenance in 1979 and 1981. The University Scrapbook Collection is organized in one series by name of subject content, arranged by order of precedence – the general University scrapbooks coming first and the discrete subject scrapbooks second which are arranged alphabetically by topic. The majority of the University Scrapbook Collection was created by George E. Nietzsche at the beginning of the twentieth century in his capacity as Publicity Agent and later Recorder of the University of Pennsylvania. Nietzsche became the head of the Bureau of Publicity in 1904 and was created Recorder in 1912, a position he held into the 1940s. The scrapbooks that Nietzsche assembled eventually became part of the Memorial Library of Publications of the University of Pennsylvania and Her Sons which was established in 1907 which later formed a core portion to the University Archives in 1945. The University Scrapbook Collections documents the publicity and public face of the University from the later nineteenth to early twentieth centuries. 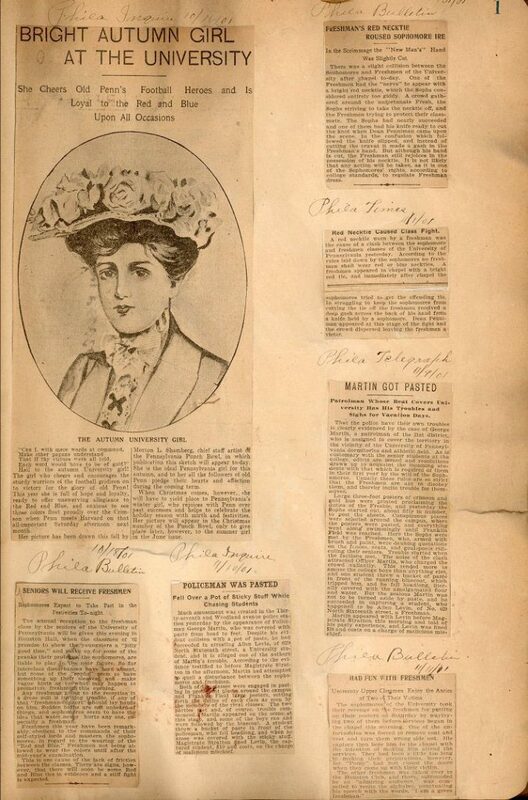 The scrapbooks consist primarily of newspaper and magazine clippings. Almost all aspects of University life are found in the collection from descriptions of important official events, such as commencements and building dedications, to informal student activities, such as dramatic and debate clubs as well as spontaneous student outbursts, such as class fights. Some important specific topics include publicity regarding the Scott Nearing case regarding academic freedom at the Wharton School. The School of Medicine scrapbook for 1902 to 1909 includes clippings relating to general medical and hospital topics in Philadelphia.